Virtual reality has never been so real! A 16:9 widescreen super-sized virtual display and superior head tracking bring your virtual worlds to life. The sunglass-style Wrap 1200VR features a 75-inch widescreen display, as seen from 10 feet (3m), a new generation of head tracking and numerous technological advancements. The Wrap 1200VR supports standard 2D video out of the box plus 3D video for a broad assortment of games, simulators and other types of applications. A new generation head tracker, the Wrap Tracker 6TC with compass, is a 3-degree of freedom tracker with automatic drift compensation that offers the best ever, "Where you look is what you see." experience. With support for the latest side-by-side 3D video format, display resolution support of up to 1280 x 720, calibration software and legacy games support provided by the Vuzix VR Manager software, the Wrap 1200VR sets a new standard in virtual reality eyewear. The Wrap 1200VR provides an unprecedented feature set including capabilities, compatibility and customization options. The Wrap 1200VR features 16:9 widescreen displays offering a 75-inch virtual display as seen from 10 feet (3m). Its twin WVGA LCD monitors support display resolutions of up to 1280 x 720 and provide a 35-degree diagonal field of view, allowing you to see more of your virtual worlds than ever before. Wrap 1200VR virtual reality eyewear can be worn over many styles of prescription eyeglasses and left and right eye focal adjustment allows most eyeglass wearers to shed their spectacles. The Wrap 1200 series of video eyewear now includes IPD adjustment for varied eye separation requirements and the patented Vuzix AccuTilt for achieving the optimum viewing angle and crystal clarity. The world of technology can be complex and change often leaves prior technologies and software investments behind -not so with the Wrap 1200VR. The Wrap 1200VR supports the latest side-by-side 3D video format and a new generation head tracker that offers improved performance and accuracy. The included Vuzix VR Manager software, its Vuzix Extensions and Vuzix 3D video drivers all support these new technologies. Virtually all programs work with the Wrap 1200VR using 2D video and more than 100 existing applications already support its new 3D video and/or head tracking systems. 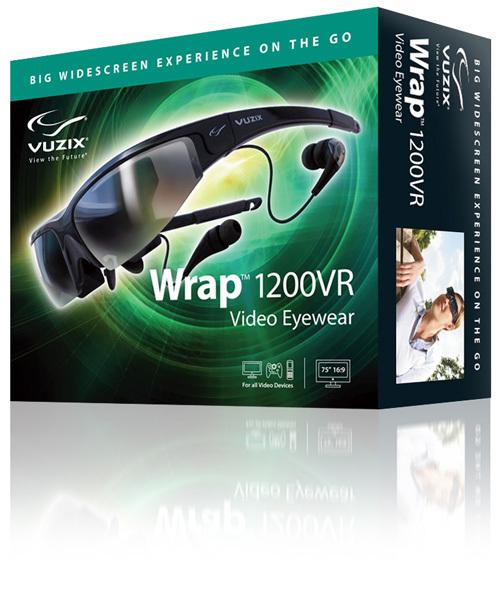 A Vuzix Software Developer Kit (SDK) is available free of charge to assist software developers in quickly and easily adding native support for the Wrap 1200VR to their applications. The Wrap 1200VR connects to virtually any Windows based video card, regardless of make or model. Windows 7, Vista and XP (32 and 64-bit versions) are all supported. If you wish to look beyond a Windows platform, optional interfaces will enable the Wrap 1200VR to connected to component video devices (i.e. : Xbox 360 and PlayStation 3) and component media devices (i.e. : iPod touch, iPhone, DVD players and cable boxes) for video playback. Each of us is different and those differences affect the visual quality and comfort of virtual reality systems lacking the unique customization options of the Wrap 1200VR. Even a millimeter difference in eye separation can affect display quality and different nose bridge shapes affect both comfort and display quality. The Wrap 1200VR is the only virtual reality system that addresses all of these factors, allowing you to experience the best video quality possible. IPD adjustment allows you to tune your video eyewear for your personal eye separation, an adjustable nose bridge adapts to your facial structure and Vuzix patented AccuTilt enables the optimum viewing angle. Never before has a virtual reality display system been this adaptable! The Wrap 1200VR - the ultimate in virtual reality eyewear.